Adelboden-Lenk Ski Resort is located in the Bernese Oberland of Switzerland – a German speaking region, between Zurich and Geneva. Adelboden-Lenk skiing is one of the biggest snow sports resorts in Switzerland comprising 5 separate ski resorts, with a total of 210 km of slopes and 72 cable cars and lifts. Of the five ski areas, we visited Adelboden Lenk and Engstligenalp – finding them ideal for families given their prepared slopes, ski schools, terrain parks and fun snow sports like sledding, snow tubing, and even igloo ice skating. Skiing Adelboden Lenk provides many different exposures and aspects, so follow the sun to find the best snow throughout the day. Make sure you save time for a mountainside chalet lunch of fondue, raclette or rosti. Kids will enjoy Adleboden’s race courses, measured speed runs and snow parks for freestyle skiing tricks. Adelboden Lenk Ski Area is the heart and soul of the region, emanating from its namesake quaint ski village. Adelboden’s trails are interconnected with Lenk, and the region is renowned for excellent snow. With 60% artificial snow making coverage, a long lasting ski season extends from November often into May. Gondolas, four and six passenger chairs with bubble covers and even t bars serve Adelboden’s prepared ski slopes from 4,438′ to the 7,217′ summit and off-piste as well, with beautiful views of the surrounding Swiss Alps. Engstligenalp, up the valley from Adelboden, is a high plateau winter playground for families, accessed by a steep tram ride. On the upper plateau, in addition to alpine skiing on two T-bars, there is cross country skiing (they call it winter wandering), sledding or snow tubing, dog sledding, even ice skating inside an igloo. Engstligenalp is perfect for young families for a day. There’s a big kinder land for children learning to ski, and snowboard, but the piece de la resistance are the igloos. The Fondue Iglu is a beautiful ice igloo where you can dine on Swiss cheese fondue sitting on reindeer fur seats in the illuminated ice cave. Adjacent is the Ice Iglu where you skate through ice carved caves and tunnels. Dog sledding is another fun activity, the dog sled musher builds his igloo and lives on the plateau for the winter with his huskies. Adelboden Lenk and Engstligenalp has four other ski centers – Elsigbach, TschentenAlp, Betelberg and Kandersteg – all offering a unique variety of lifts and trails. There are over 10,000 beds in the Adelboden region, and plenty of Swiss restaurants and après ski bars. We stayed in the quaint ski village of Adelboden. Bellevue Park Hotel and Spa in Adelboden is perfect for families, perched high on the hillside above town with superb views of the mountains and valley. This 1901 Hotel was completely rebuilt after a 1930’s fire and has received a more recent modern makeover, adding a splendid full service Spa featuring indoor and outdoor heated saltwater pools, and adult spa area with Finish Sauna and spa treatment rooms. The 53 guestrooms range for modern alpine to more traditional Swiss. Half board lodging at Bellevue includes a bountiful buffet breakfast, and a four course gourmet dinner. The chic dining room and lounge, with modern gas fireplace and a wall of windows providing mountains views, serves cocktails, and offers a convenient playroom for the kids off to the side. The hoteliers have young kids and they make families (and pets) feel very welcome. The Bellevue even has a ski room with boot dryers. 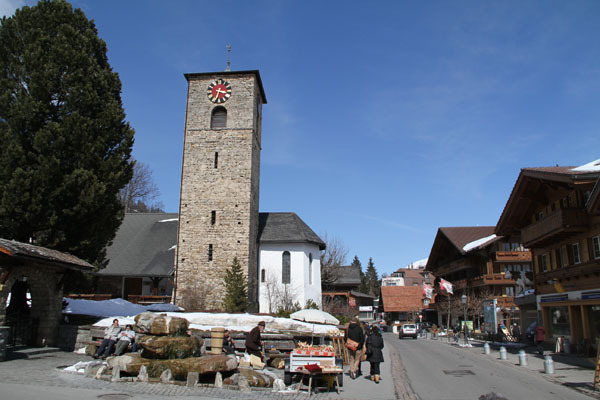 Adelboden village is steps away with Swiss shops and restaurants. Show the kids the 1433 church and Adelboden’s World Cup Ski Racing statue with the footprints of winning racers including Bode Miller. On your way through Frutigen, if time allows, take the kids to the Tropenhaus Frutigen to see the sturgeon and caviar farm. This tropical garden and fish farm recycles the warm spring water discovered when building the 34-kilometer train tunnel to Wallis and grows sturgeon, caviar, as well as exotic plants in an interesting sustainability project. Adelboden Family Ski Resort Stats: Elevation 7,217′, 4,438′ Base 4,133′, Vertical drop 3,084′, 72 lifts including and 210-kilometers prepared trails plus off-piste in six unique ski regions. Travel to Adelboden: Fly into Zurich or Geneva, take a 3-hour Train to Frutigen, then a 20-minute Bus to Adelboden.